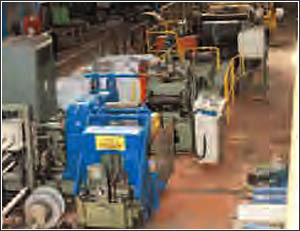 Description: Annealing and Patenting Line, Mfg. 2000. Width Range: 180mm – 460mm •• Gauge Range: 0.4mm – 2.5mm •• Max Line Speed: 5.8 M/min •• Max Coil Weight: 4000kg •• Pickling Mode: Hydrochloric Acid – Caustic Acid •• Max Coil Outside Diameter: 1300mm •• Decoiler Mandrel Diameter: 510mm •• Latest Modification: 2000 to Anneal Textured Material.